A few months ago, I did a Weekend Writer post on creating a writing portfolio before submitting. But once you've done that, submit. Years ago, they used to say "Nothing gets published, if it's sitting in your filing cabinet." Now we'd probably say, "Nothing gets published, if it's sitting on your hard drive." Earlier this summer Kim Liao's essay, Why You Should Aim for 100 Rejections a Year, got a lot of attention on Facebook and Twitter. The point here is that you can't get rejected, if you don't submit. And, of course, you can't get accepted, if you don't submit. There may be something going on here with odds, too. The more you play, the better your chance of winning. The more you submit, the better your chance of acceptance and publishing. While I don't have any expectation of making one hundred submissions this year, I have been making an effort to submit. I've done eighteen so far, with two more planned for next week. 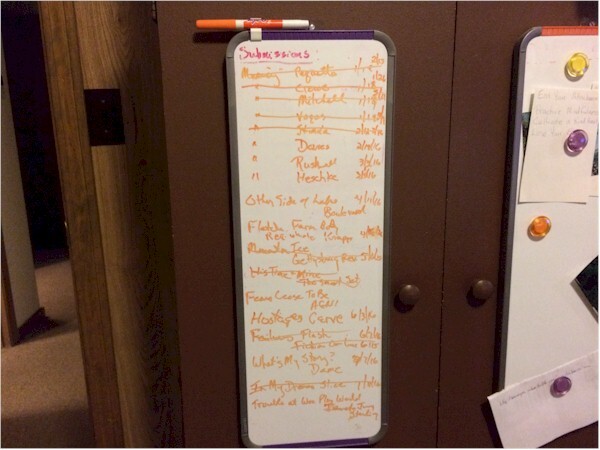 And I do have a better way of tracking submissions than that board on a cupboard. But a board on a cupboard is fun. I'll be going on to the second board soon.